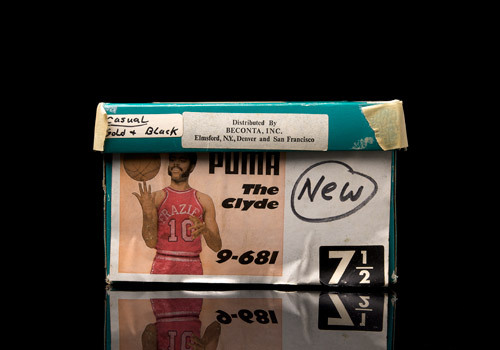 What I’m reviewing today is probably the most prized possession of my PUMA Suede and Clyde collection. Not a new release by any means, but a genuine OG vintage model, made in Yugoslavia, straight out of the green box. There’s a story behind this shoe, for me at least. 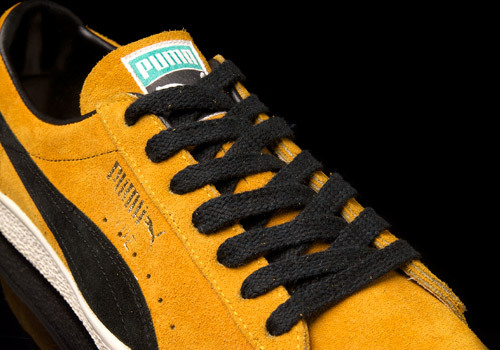 When I was thirteen or fourteen years old all I wanted in the whole world was a pair of those suede PUMA’s that I didn’t know the name of (followed closely by those adidas with the shell-toes). 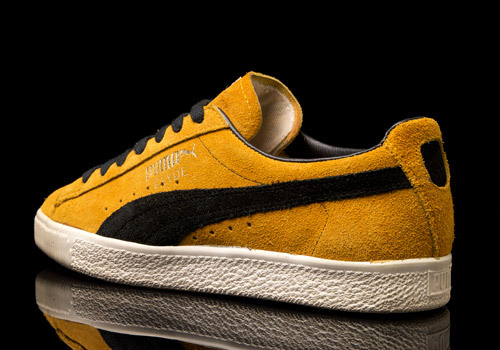 I’ll be forty-two next week, so this has nearly been a thirty year obsession, and I’ve an entire wardrobe of PUMA Clyde’s to prove it. At that time in the UK the only pairs that could be seen in the flesh would be on the feet of a few b-boys that I would go to watch breaking in Covent Garden on a Sunday. Nobody who had a pair was completely upfront about what they were called. 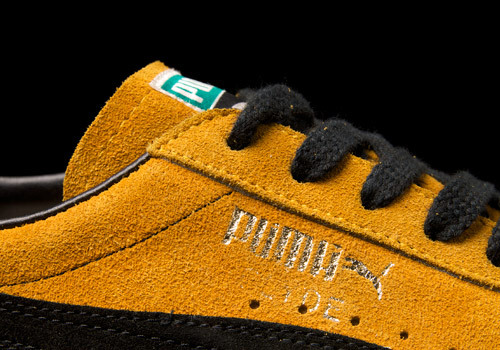 For a while I thought they were called PUMA Joints. No surprise really as this was the era when people still blacked out their record labels. Knowledge was a closely guarded commodity. 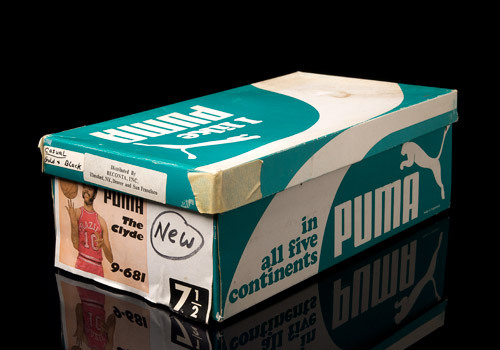 This is before the release of the PUMA States. You couldn’t get these shoes in England, maybe not even in Europe. They were the most perfect sneaker I’d ever seen in my life. Simple, stylish, streamlined, and with great colourways. White leather sneakers definitely took second place to a nice coloured suede shoe in my opinion, not just at that time but even to this day. I became completely obsessed. I would look out for these shoes everywhere. I even used to spot them in Hollywood movies, and not including Beat Street (which is like a candy store full of PUMA) I spotted them on the feet of Eddie Murphy in Trading Places and on Dustin Hoffman in Tootsie. Then the States were released in 1985 I believe, following even more exposure in books such as “Subway Art”. When I copped a pair of these, I was almost satisfied. They weren’t quite the same. No holes around the formstripe, a slightly thinner and less flat outsole, among other, extremely minor but notable differences. So, close, but not enough to quiet my obsession. The States soon vanished from the market and even in the late 80s were a sought after item. 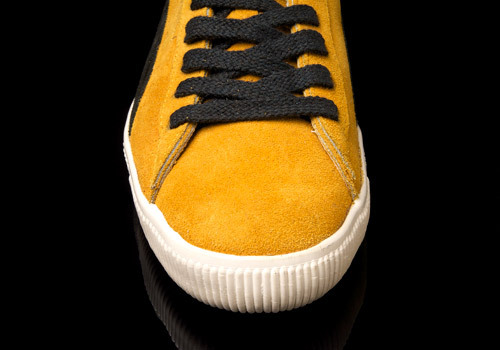 Between this point and the release of the 90s PUMA Suede I picked up a pair of OG Yugos in “charcoal” grey with a silver plastic formstripe from Duffers of St George. 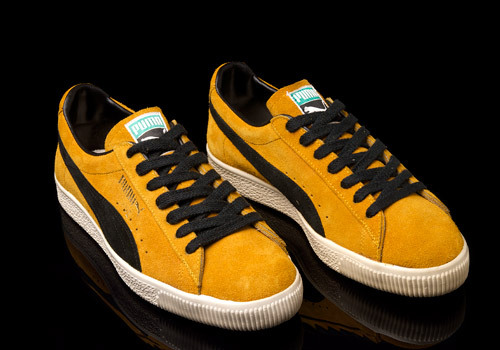 Duffers and a couple of other stores located around Soho had gone out to the US (presumably) and grabbed as many original issue suede PUMAs, adidas Superstars and Campus that they could find. They were selling for fifty pound a pair, which in 1990 was probably what one would pay for a pair of Jordan’s. 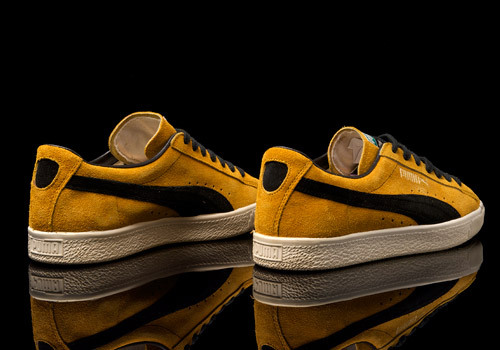 Over the years, I have made it my task in life to cop as many of this original shoe as I can. In my humble opinion, all other variants and models can’t touch this original ‘Made In Yugoslavia’ model. 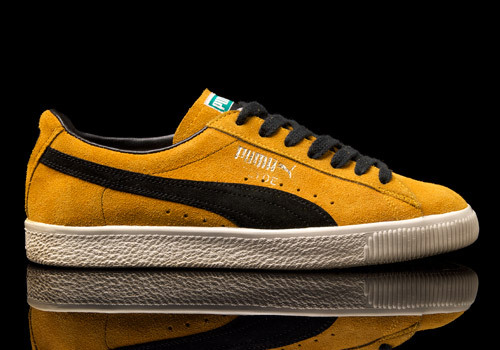 This particular pair, a mint in the box, black on gold colourway, are the jewel in the crown of my collection. I paid a pretty price for these. But you just don’t see these anymore. The definitive shape. The curves of this shoe are like a vintage Porsche 911. When you put them on it’s like a time machine took you back to a Zulu nation jam in the park in the formative years of hip hop.